You may see the following error in the order history from Zentail System for a Facebook order or in your Needs Attention tab in the orders view. 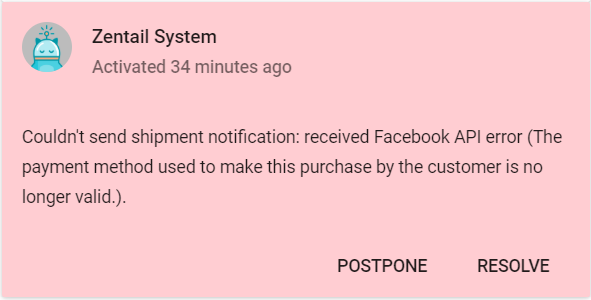 This error means that Zentail was unable to send a shipment notification back to Facebook because the payment method the customer used was invalid. To resolve this error, please reach out to Facebook support to verify whether the payment was accepted or not. If it was accepted, you can click the "resolve" button on the error and manually resolve it to fulfill it. If it was not accepted, please cancel the order. If you see a Facebook API error on an order that is not the same as the error above, please reach out to the support team using the chat feature in Zentail or by sending an email to [email protected].